OneLink operates Monday to Friday (excluding public holidays) from 8am to 6pm. If a message is sent outside of these times, our staff will review your request and get back to you in the next business day. Interpreter Service: If you require an interpreter, please call the Telephone Interpreter Service at 131 450 and ask them to call OneLink on 1800 176 468. Agency referrals: Click here for agency referrals. 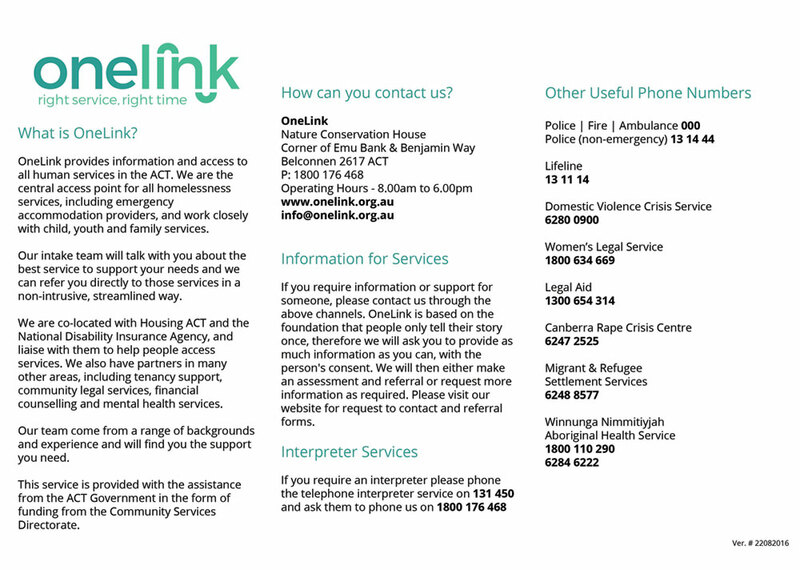 Please contact OneLink on 1800 176 468 to make an appointment to meet one of our Intake Officers at one of these, or other locations. OneLink are committed to providing outreach to those in need and are currently reviewing the days, times and locations for outreach. For further information and contacts please download our OneLink Flyer.